The Royal British Legion, Republic of Ireland District, supported by the Irish Government, hosted its Annual Ceremony of Remembrance and Wreath Laying at the Irish National War Memorial Gardens, Islandbridge, Dublin, on Saturday 07 July 2018. The event commemorates all those who lost their lives in the World Wars, in particular the estimated 60,000 Irish men and women from the island of Ireland who served and died in both wars. Representation from all parts and traditions of the Island of Ireland is a key feature of the ceremony. Designed by the memorialist Sir Edwin Lutyens, the War Memorial Gardens are dedicated to the memory of Irish soldiers who died in the 1914 – 1918 war. The names of all the soldiers are contained in the beautifully illustrated Harry Clarke manuscripts in the granite book rooms in the gardens, Major Brian Duffy (Retd), District Chairman of the Royal British Legion gave the Welcoming Address. The ceremony was held in the presence of government and civic leaders, members of the Oireachtas, the Diplomatic Corps, representatives of the Defence Forces, representatives of Regimental Associations and Veterans Associations, and a considerable number of relatives of those who served in World War 1 and the Second World War. The Military Heritage of Ireland Trust was represented by its Chairman Brigadier-General Paul Pakenham (Retd) and Colonel Harvey Bicker (Retd). Royal British Legion Branches from Ireland and Branches from Northern Ireland, along with other Regimental Associations and Veterans Associations paraded their Standards at the ceremony. 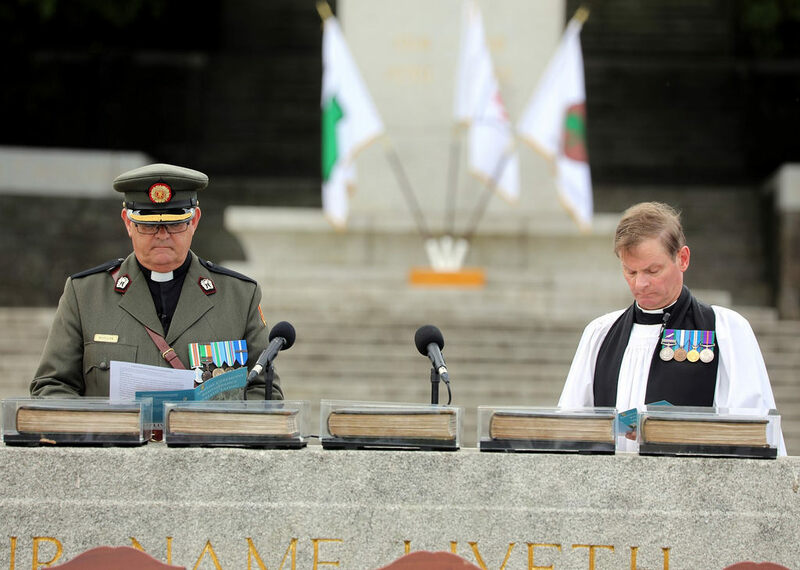 Reverend Peter Rutherford, Rector of Kinsale, Chaplain to the Royal British Legion (RIO) formally Assistant Chaplain General HM Forces, and Reverend Fr Seamus Madigan Head Chaplain to the Defence Forces were the Officiating Clergy. Under the direction of Major Brian Duffy (Retd), the Lords Mayor, Ministers, Ambassadors, Defence Forces, Regimental and Veterans Associations, civil organisations and relatives laid wreaths at the War Stone. Music, including the Last Post, the Rouse and the National Anthem, was provided by the Band of the 2 Brigade and Piper from the School of Music under the direction of Captain Thomas Kelly, with the Band of the 2 Battalion and Piper from the Royal Irish Regiment under its Bandmaster WO1 Richard Douglas, and the voice of Elizabeth Woods and supporting vocalists. The Lesson was read by Josepha Madigan T.D. Misister for Culture, Heritage and the Gaeltacht. The Exhortation and The Dedication were delivered by Lieutenant-Colonel Ken Martin, President, the Royal British Legion, Republic of Ireland.